Someone wrote about The Color Purple that it is a novel of permanent importance. This was such a lovely way to think about it! I was charmed. Even though I realize permanent might not be that long. However, while I was reading Michelle Obama’s book BECOMING I felt the same way: that it is a book of permanent importance. We are not likely to see another black American First Lady in several lifetimes. And surely not one as solidly brave, thoughtful and candid as she. What a breath of fresh air from a direction gone stale with …well you name it. And no, this does not mean I’m not still aware of the areas in recent memory where I am way off the political chart of most Americans’ thought – I see that more clearly as I age – but it seems to me Michelle Obama has offered us the chance of a lifetime to truly comprehend what it takes to attempt to lead a wildly dysfunctional country. One that lies about its history practically every day, and therefore will probably never understand what it is. A big, fat, corporation, that requires someone considered trustworthy, by the major shareholders, whoever they might be, to run it. And that is what the reader can’t help but realize, reading or listening to Michelle Obama, as she carries us without embellishment through her days in the political rat race. How can humans stand it? Why must they? Humans are not rats, why must they be demeaned in this way? Running for a chance to help us, but harming themselves, or frequently being harmed, in the pursuit. And we, meanwhile, the public, trained to abuse anyone who sees our value and fights to enhance it. And no, I am not saying anything that encourages a smug putdown. I know what imperfection is. But it no longer fazes me. What I love is effort. Dedication. Trying to get something good for others even when they’re complaining and kvetching. This to me is warriorship. Going on when folks twist your words. Going on when they want you to be shorter, lighter complexed, with not quite such outstanding hips. Or, on the other hand, when they think you’re not even a woman! It was at that point, years ago, that I threw up my hands. 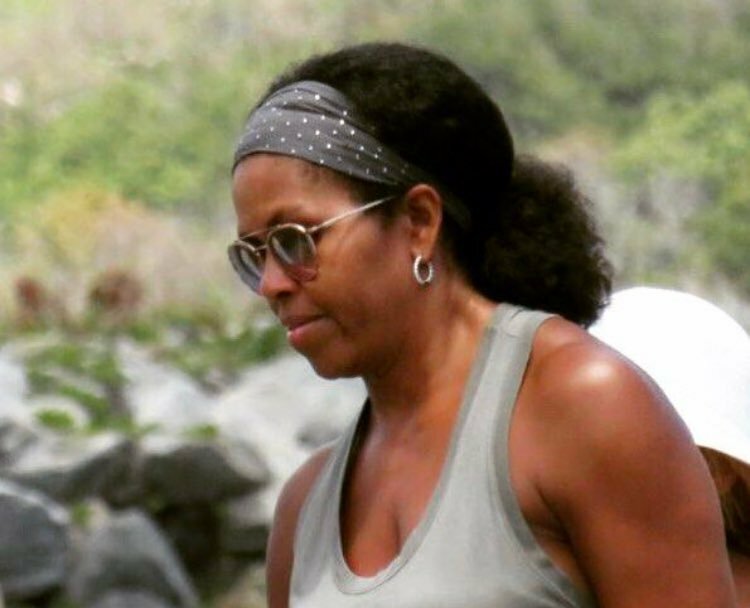 This beautiful woman, Michelle Obama, not a woman? What I really thought about was how prevalent just her size, height, color, shape of woman was in my native community in Georgia. And how we adored Her. Perhaps this adoration was a casualty of integration, another idea we must collectively reconsider. I am so grateful for BECOMING. Among so many things, we have a chance to see what a healthy, solid, functioning black family looks like, and what strengths it can produce in its offspring. Obama’s mother, and especially her father, offer us a rare look at a love of their children that is replicated by Obama and her husband. One of the tragedies of our sojourn here as people of color- especially if we are poor, as so many of us are or were – is how each generation has suffered economic and social upheavals and desperations, so much so that parenting has too often been, as my daughter once said to me about my own, “neglectful.” That a parent can do all that she humanly can, and still be found lacking, is a great sorrow. Too many of us have been there. It is actually medicine, then, in BECOMING, to witness the lengths both Obamas go to be present and supportive of their girls. That the girls may grow up to blame them for something else entirely – well, there you have it. The risk of parenting at all. In Obama’s book there is no sign of that. Just as there is no sign of regret that she and her family gave all that they could give to the job of running a country. One they left in better spirits than they found it, if still confused, if not dismayed, that America’s political structure could choose a Trump when a Sanders or a Stein was closer to where so many of us were. This piece you have sent to me re: Obama is well said. I will attach it to the glowing review I gave her book, which is extraordinary but missing this important point – among others, no doubt, which I hope others will address. I will also attach the original link. > segregation that gave rise to a “narrow mindedness” in matters regarding race. > of slavery and legal discrimination. > children into the White House so that she could personally encourage them. > black and brown students here and there to, in her words, say, “You belong. > and valuable to the hundreds of young people who encountered Obama in person. > institutional interventions—and beyond—that made her ascent possible.